ODRAO started as an idea for myself to do something that seemed on the edge or beyond what I or others could do mentally and physically. I needed something to focus on when my second daughter was diagnosed with Hodgkin’s Lymphoma four years after the first daughter in 2010 both at the age of 24. I had lived most of my life without exploring my home state and this seemed to be the time. I designed the course with an Ohio map and many hours in doctors offices and late nights over the long process of getting a very special person healthy. Both are doing fine now and I am left with the challenge at 58. I still feel strong though only the trail will tell. Beyond my own challenge I think a cross Ohio in a single day is a really cool idea and I look forward to finding more people to make this an amazing ride / race with a grand finish in Cincinnati. 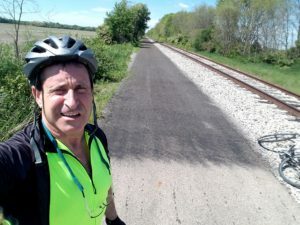 The course is just amazing, country roads in Northern Ohio away from large cities as much as possible, passing though many amazing small towns, then for the Southern Ohio track when the state gets much more congested and the rider less energetic, in comes the wonderful bike trail to provide a smooth path to the river. 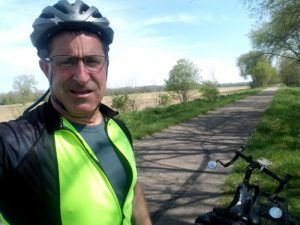 Ride #2 – Loveland to Cedarville and back 100miles, good start to the long training rides I felt good and held a consistent ODRAO pace. Felt better at the end of the 100 miles than when I started, lots left in the tank. Running a bit late on training rides this year though made a seem less jump from 50 in January to 100 in May. Will attempt another 50 mile jump to 150 miles in a couple of weeks on the third training ride to make up for lost time this year. Leveraging all that I have learned in the past 4 years to get in a position to make an attempt around the longest day of the year in late June. 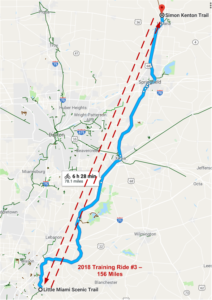 Ride in 2016 Results: Left Lake Erie 6:15am Stopped at Xenia 7:00pm 170 miles, 2 hours faster than 2015, need to be in Xenia by around 5:00pm to make a run at getting to the River at Cincinnati by sunset. Ride in 2017 was interrupted by unexpected life event involving someone special needing my help for the summer. Will continue to train for 2018 and work on weak areas. Going to pull together all that I have learned from previous years and some help from friends, for an attempt in 2018 around the longest day, Expecting June 9th or later depending on training rides and wind conditions. 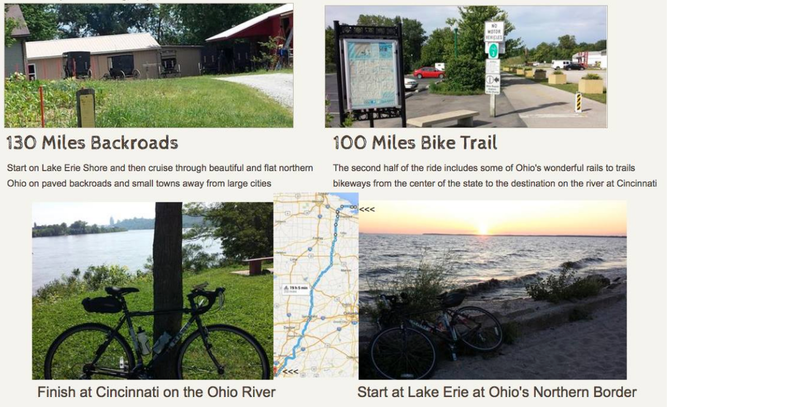 If you are interested in learning more about the building of a ride across Ohio from Lake to River in one day, please email me at info@odrao.org. For The Ohio State University Fans like myself note Michigan has a ride ODRAM which is a simple 145 miles, this ride is around 225 miles with the current course is in line with a challenge for OHIO !! !